Comfort, to me, can be a good thing or a bad thing. Of course the comforts in life that I love are good things—like the comfort of my home, spending time with Scott & the cats in our pajamas, spending time with good friends, taking photographs, having a glass of wine. On the other hand, there are bad comforts—getting stagnant because I am afraid of success, doing the same thing for years without any progress ... those are the comforts that deserve goals, and challenging, and questioning. 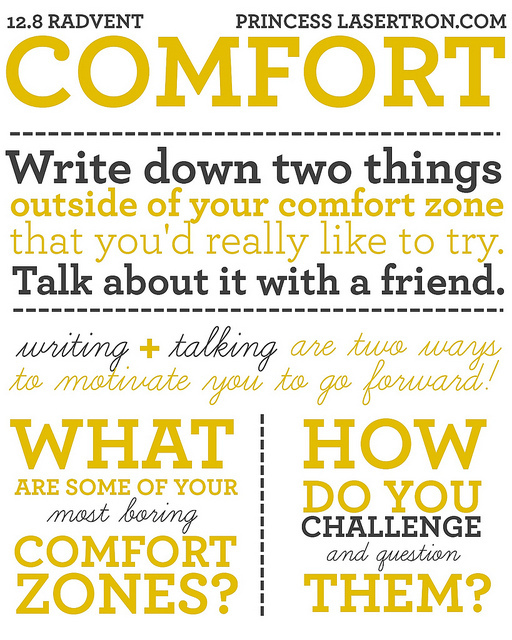 "What are some of your most boring stubborn comfort zones?" I think "boring" is a bad word and should be banned from the English language ... I'd rather, in this case, use "stubborn" comfort zones. Ones that are probably not beneficial to me, but that I have a hard time changing. One comfort zone I've been in for far too long is my day job. I work at a pretty neat place, though, to be perfectly honest. Over the almost five and a half years I've been there, I've made some true friends, been challenged in different ways and have grown to love my coworkers like a highly dysfunctional family. But I've been stuck at the same level for almost 4 years now, and so far my attempts to move up have failed. I won't say more than that, but right now I'm trying to forge a path forward and upward, and that's a huge challenge. I do know that I tend to think staying and stagnating further is the path of least resistance and thus easier ... but I also know that personal growth never comes from the path of least resistance. Regarding my photography, I tend to get into this type of comfort zone: I will meet a band, or a group of people throwing an event, and then I will get stuck in a rut where I only end up going to that band/group's shows, for a period that far exceeds reason. Of course there's a time and a place for long term gigs and for following a band or group's evolution over time, but not, as I've discovered, at the expense of my career. I am an obsessive personality by nature, so this is tough for me to "turn off" once the switch has been flipped. The ways that I challenge & question them are constant these days, because they are rarely off of my mind. I have a talk with myself: am I doing what I should be doing? Is this good for the future, or am I just doing this because I want to, or because I feel lazy, or because I don't have to/want think about it or put in the effort to do something different? Usually, that's enough to get me to rethink everything, though the amount of times that's turned into real change has been marginal (at least so far). Figuring out the gooey nougat center where what you want and what is good for you can be a challenge, but I love a good challenge. You know?